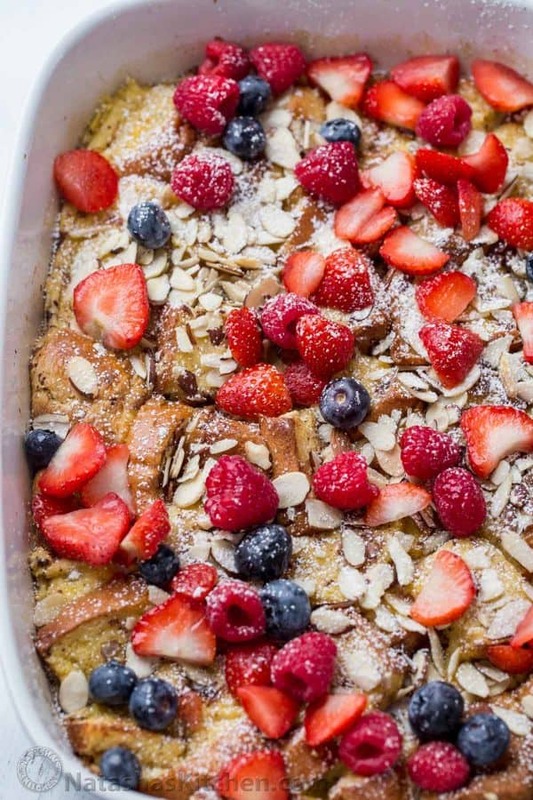 This Easy French Toast Casserole is bursting with so much flavor! 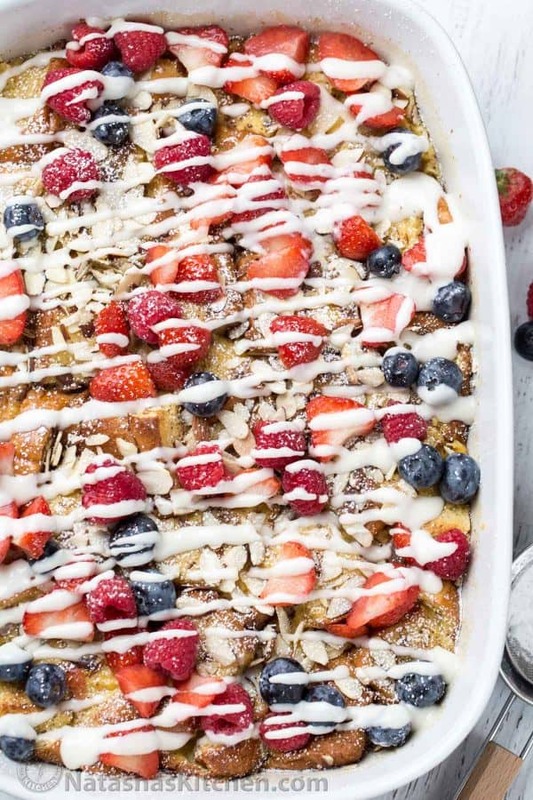 This breakfast casserole is loaded with almonds, fresh berries and a cream cheese drizzle – an amazing combination. 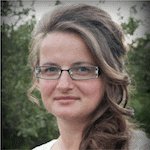 You will love the make-ahead option. Just like our overnight cinnamon rolls, this overnight breakfast casserole will become a favorite to serve the family. Hey, hey! 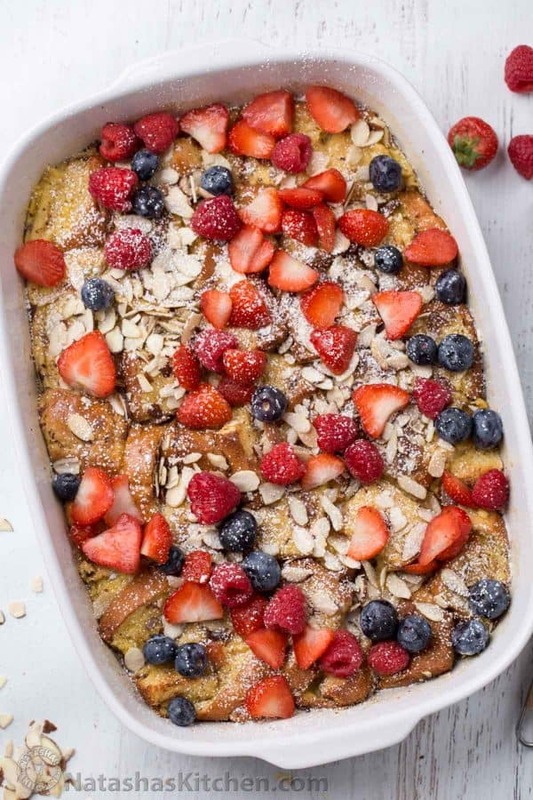 Valentina with Valentina’s Corner sharing an amazing Berry French Toast Casserole. 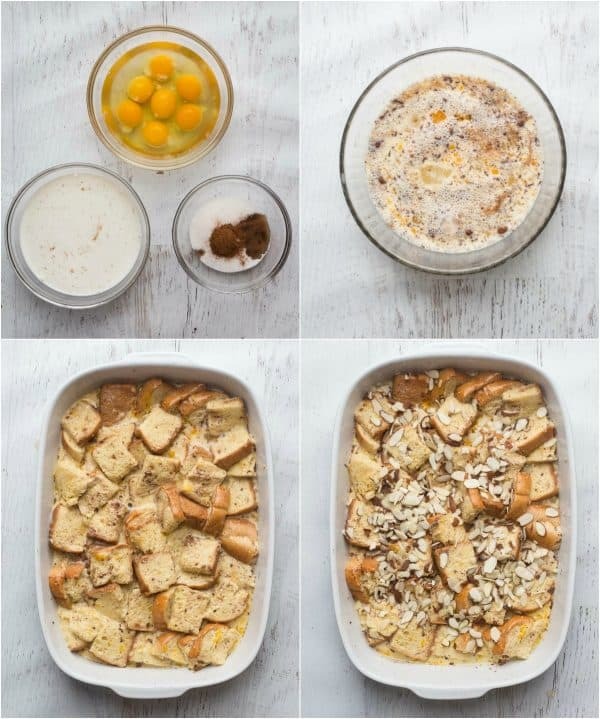 This French Toast Casserole is everything you can ask for in a breakfast casserole. It’s not overly sweet, yet hits the sweet spot! 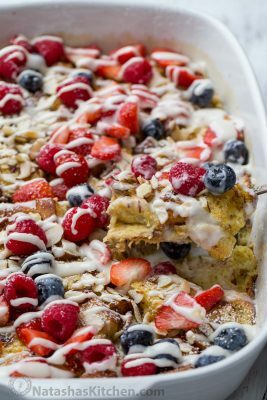 Bread chunks in a cinnamon egg mixture, topped with sliced almonds that become crispy once baked, fresh berries that add to the flavor and finished off with a cream cheese drizzle that take the recipe over the top! Serve the French Toast Casserole on the weekend, for a special occasion like Mother’s Day brunch, Valentines Day or the Holidays! 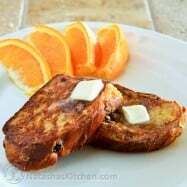 How to Make French Toast Casserole? Cut bread into 1” cubes. In a large bowl, whisk together eggs, milk, cinnamon and sugar. Add bread and stir to coat. Sprinkle on sliced almonds, cover and bake breakfast casserole. 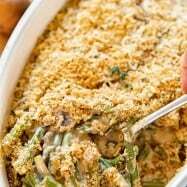 TIP: If you don’t like almonds, use walnuts or pecans, add them to half of the casserole, or omit nuts. Do I Have to Use the Cream Cheese Drizzle? 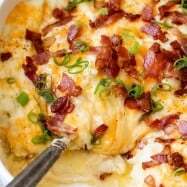 TIP: Since the overnight breakfast casserole will be cold, add an 5 minutes to the covered baking time then continue baking per the recipe. 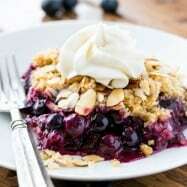 What is the Best Bread for French Toast Casserole? Brioche Bread, Challah Bread French Bread or even Italian Bread that can be sliced into about 1” squares will all work great. Use bread that’s at least a day old. 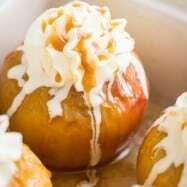 It will soak the egg mixture better and won’t taste soggy or mushy. TIP: If your bread is a really large loaf, you may not need the whole loaf. 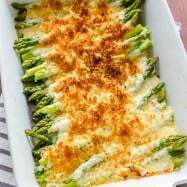 The casserole is best and most crisp right out of the oven, but it can be reheated. To reheat, bake at 350˚ F for 10 to 15 minutes or until warmed through and top is re-crisped. For more breakfast ideas, check out our full breakfast recipes index. This Easy French Toast Casserole is bursting with so much flavor! 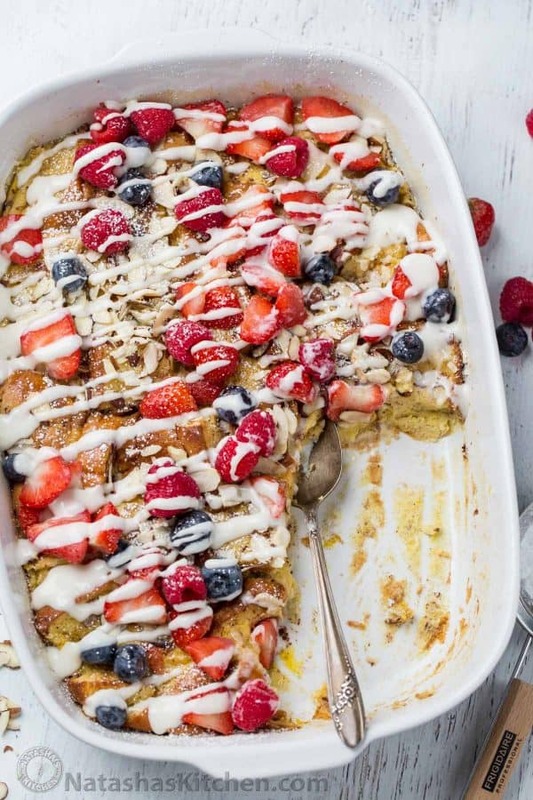 The casserole is loaded with almonds, fresh berries and a cream cheese drizzle - an amazing combination. In a large bowl, whisk together the eggs, milk, heavy whipping cream, vanilla, ground cinnamon and sugar. Cut the bread loaf into 1” cubes and add them to the egg mixture. Stir to generously soak the bread then transfer to 9x13 casserole baking dish. Pour any remaining egg mixture over bread and arrange bread evenly, patting down if needed. Sprinkle the top with sliced almonds, cover and bake at 350˚F for 20 minutes then uncover and bake another 15-20 minutes, until tops of bread are crispy. 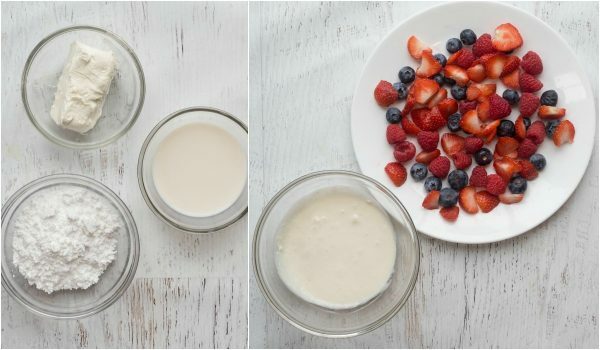 To serve, top with fresh berries and use a teaspoon to drizzle cream cheese over the French Toast Casserole. I had done similar recipes but as was having a number people for brunch decided to try this one. However when i was in the bakery section to get my bread, I saw a box of mini cinnamon rolls, about 1″ by 1″. As a number of years ago, I was in Chicago and had a french toast made of cinnamon roles I decided to to try the minis. About 40 of them (1kg). Another french toast recipe idea for you.